Recently I was checking out a bunch of people on Twitter who began to follow my updates @dmscott. When I went to @AFPAA I was surprised to see the Twitter ID belonged to the US Air Force. There were less than 200 people following the Air Force, indicating someone new to Twitter. Now this is interesting I thought, the Air Force on Twitter. I sent a DM (direct message) to find out what they are doing and received an immediate answer from Capt. David Faggard, Chief of Emerging Technology at the Air Force Public Affairs Agency in the Pentagon. We traded a few emails and then spoke on the phone. Capt. Faggard and his Air Force Emerging Technology team is responsible for developing strategy, policy and plans for an ever-changing communication landscape for communicators worldwide. What was most interesting is that with Capt. Faggard leading the way, the Air Force employs 330,000 communicators! Their mission is to use current and developing Web 2.0 applications as a way to actively engage conversations between Airmen and the general public. Yes, that’s right, the goal of the program is that every single Airman is an on-line communicator. In an environment where many corporations are scared witless about social media, here a huge global organization firmly committed to social media communications to spread messages, stories, knowledge and ideals. Capt. Faggard says that the focus is on: "Direct Action within Social Media (blogging, counter-blogging, posting products to YouTube, etc. ); Monitoring and Analysis of the Social Media landscape (relating to Air Force and Airmen); and policy and education (educating all Public Affairs practitioners and the bigger Air Force on Social Media)." While I was amazed that the Air Force is doing so much while many in the private sector are still doing so little, I asked about the unique challenges faced by the US armed forces when it comes to social media. In particular, I was intrigued by the term "counter-blogging" which Capt. Faggard says is when "Airmen counter the people out there in the blogosphere who have negative opinions about the US government and the air force." Note: Please see the Air Force blog assessment flowchart at the bottom of this post. Airmen must be accurate within parameters of safety. If you're nineteen years old and based in Afghanistan, you don't just go and update your Facebook status with your exact location and duties. "We educate people in the Air Force about security of social media to make sure that people don’t expose secrets via Twitter or Facebook some other media," Capt. Faggard says. "However, many airmen are really smart and communications can be very valuable to families and friends back home so we don't want to close it down completely." Besides Twitter, Capt. Faggard writes The Official Blog of the U.S. Air Force; has pages on YouTube, MySpace and Facebook; helps publicize a Second Life area called Huffman Prairie; contributes to iReport (user name USAFPA); and is on Friendfeed, Digg, Delicious, Slashdot,Newsvine, Reddit. There’s Air Force widgets. And there's even a video mashup contest for high schools to show school spirit sponsored by the Air Force. It's not just the Air Force. Several months ago I led a training session organized by SSgt Alexis Mulero, Public Affairs Chief for the communicators in the 1st Marine Corps Recruiting District. Since most teenagers and young adults spend lots of time on Facebook, YouTube, and other social media sites, a major challenge in recruiting young people into the Marines is reaching them online. As a result of a focus on social media, SSgt Mulero says that his team has greatly increased the positive exposure of the Corps across the Northeastern U.S.
Back at the Air Force, Capt. Faggard’s team is growing from three to 16 people in just a few months. "There has been resistance; but the leadership of the Air Force is very supportive of what the expert communicators say are the best ways to reach people. So if I need to speak to 18 year olds, then they are supportive of using tools like Facebook that I need to reach them. We are on the verge of a revolution and it is an information revolution. The Air Force is doing new things and we're on the forefront. We'll make mistakes, but it is kind of cool to see what we can do." 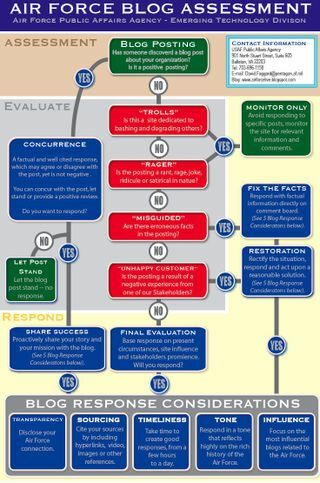 I particularly like the detailed Air Force blog assessment flowchart that Capt. Faggard shared with me. It provides, in simple to understand, but in a detailed and specific way, how to react to blog posts. Everyone should take a look at this and consider applying something similar in your own organization. Click the assessment for a larger size image.